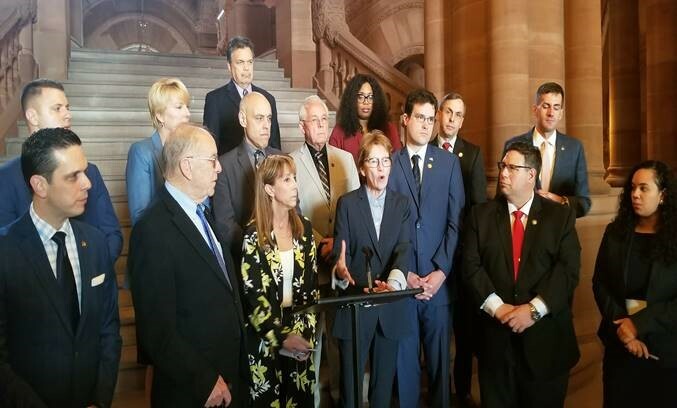 NYAPRS Note: NYS Assembly Mental Health Committee Chair Aileen Gunther led a group of Assembly colleagues from both sides of the aisle in a fiery call on the Cuomo Administration to fund a long promised Cost of Living Adjustment for human service nonprofits. Cheering her on was a group of advocates for community providers who serve New Yorkers with mental health, substance use conditions and developmental disabilities, including NYAPRS, MHANYS, the NYS Council, Families Together, NAMI NYS and the Association for Community Living. The advocates will be accelerating our efforts in the coming days. Assembly members on both sides of the aisle rallied in the Capitol on Wednesday morning to highlight their support for increased human services funding in the final budget deal due at the end of the month. The members touted the chamber’s one-house budget, which reinstated a 2.9 percent cost of living adjustment for workers in the human services sector that was left out of Gov. Andrew Cuomo’s proposed budget and added a 2 percent raise for direct care workers employed in the mental health and developmental disabilities fields. “They earned every cent of this raise, and probably a hell of a lot more,” said Assemblyman Aileen Gunther, chair of the Assembly’s Mental Hygiene Committee. She said the governor’s proposal to leave out the COLA would exacerbate the staffing shortage in New York. “People have passion for the work, but they have to be able to survive in the world that we live in,” Gunther said. The Assembly’s proposals would cost an additional $198.5 million, according to a press release. The governor’s budget memo says deferring the COLA is necessary because of the $142 million in savings that would be realized. An increase was also put off in last year’s budget. Gunther said there are “other things that aren’t as important” in the state’s $174 billion spending plan, and identified economic development incentives as an area where they could “shave” off some spending to afford raises for workers. “I could get a list if I went through the budget,” she added. There is some speculation that Cuomo’s delay of the COLA was a negotiating ploy that would make state lawmakers “buy back” the program at the expense of other priorities. “It’s kind of like a silly game,” Gunther said. The proposal from Senate Democrats would also start implementation of the COLA in 2020. “The Senate is also committed to continuing the agreed-upon 3.25% raises for direct care workers,” reads the chamber’s budget resolution.